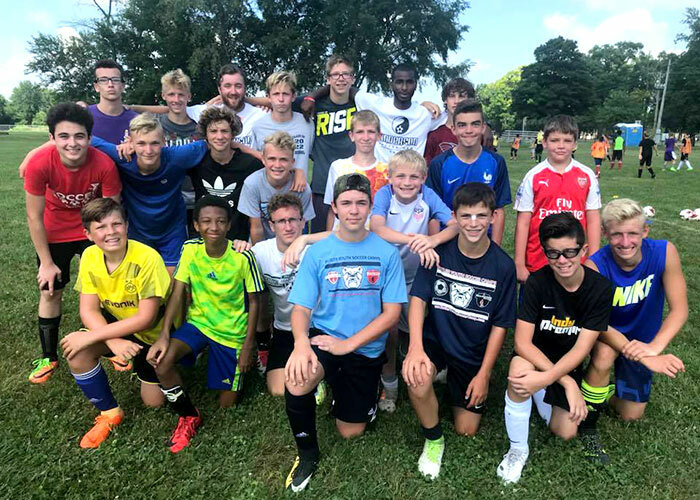 For 25 years, Anderson University has been home to Anderson Soccer Camps. More than 7,500 players have attended since this camp was founded. We focus on developing the whole player. Stay overnight with our residential option, or come and go with our day camp option. For questions about the program, contact Coach Scott Fridley. Have a player who is just starting out? Check out Anderson Kickers. Looking for a team camp? Check out Men’s Soccer High School Team Camp. Check in on Sunday from 5-6 p.m. Check out at 4:30 p.m. on Thursday immediately following the awards ceremony. Check in on Sunday from 5-6 p.m. and pick up at 8:30 p.m. Arrive daily at 9 a.m. and pick up at 8:30 p.m.
Overnight: $399, includes room, meals, t-shirt, ball, swimming, camp picture, counseling awards, and an individual evaluation. Day: $299, includes meals, t-shirt, ball, swimming, camp picture, counseling awards, and an individual evaluation. Scott Fridley, camp director, heads into his 25th year as founder and director of the Anderson Soccer Camps. He is starting his 28th year at Anderson University, coaching the men’s soccer team. He is nationally licensed by the NSCAA and the USSF. His men’s team has won two conference championships and two post-season tournament championships and registered over 250 wins. He served four terms on the NCAA tournament selection committee for men’s and women’s soccer and serves on the NSCAA National Ethics committee. His teams have been named NSCAA All-Academic Team 20 times and NSCAA Ethics Team 7 times. He has coached 28 years of youth travel soccer and has recorded more than 350 wins. Jennifer Myhre, camp staff, returns for her eighth year. Coach Myhre has coached the AU women’s soccer team for seven years. She was previously the assistant women’s soccer coach at Carnegie Mellon University and Luther College. Myhre graduated from Messiah College. While playing there, the Falcons captured the NCAA Division III National Championship, were semi-finalists twice, and tournament finalists once. Myhre holds her NSCAA National Diploma, as well as a USSF “C” coaching license. Drew Zellers, camp staff, returns for his 12th year after serving five years as a camp counselor. Zellers coaches in Columbus, Ohio. Zellers holds the NSCAA Advanced National license and the USSF C license. Bobby Holden, goalkeeping director, returns for his 12th year. He has served as the goalkeeping coach at AU for the past five seasons. Holden was a four-year Letterman at AU as a goalkeeper. He does individual, team, and club goalkeeping instruction. He is in year 3 as the Greenfield High School men’s soccer coach. He is the DOC for USF Real Soccer Club and runs his own keeper training programs. He has become known as one of the top keeper trainers in Indiana. He holds the NSCAA Premier coach’s license. Sunscreen is suggested for the hot, sunny days of course. This is to your child’s discretion. Full Keeper staff with daily instruction and training sessions. Groups for training will be separated by gender and skill at different sessions. Evening sessions will be game sessions with a variety of games being played. In the dorms, boys will NOT be allowed on girls floors and vice versa, NO Exceptions. When away from the dorm, all campers must stay with their counselor. Meals are in the Olt Student Center. Housing in Martin Hall with counselors. Boys and girls stay on different floors and are monitored while in the dorm. Water is provided at the fields. Water Jugs are welcome. The awards ceremony will be shortly after our last session. You will get your room assignment and roommate at check-in. Licensed athletic trainers on site for the entire camp. Bring your own athletic tape if you need to be taped by the trainer. All medicines need to be brought to the trainer table at check-in and explained if the child needs assistance. Pool opportunities will be available each day. Rain plans include campers playing inside the 133,000 sq. ft. Wellness Center. Day Campers will stay in the dorm lobby for free time or are welcome to hang out the rooms of their friends who are residential campers. Day Campers should be picked up at the dorm ONLY at 8:30 p.m.
DO NOT PICK YOUR CAMPER UP AT THE FIELD. Bring your own tape if you need to be taped by the trainer. If you need to contact the camp during the week please email the director. If you decide to stop by camp during the week, we ask that you stay out of view of the camper so during sessions so we can keep the campers attention. Q: Can I send mail to my child during camp? A: Yes, we deliver daily when the campers are together, follow directions on the website. Q: Can we bring birthday treats for our child? A: Yes of course, please work it out with the Director so we know when to expect you. Q: Can we come watch training? A: We would prefer if you want to check in with your child to do so when they are in free time or in the dorm. We would like their full attention during training sessions. Q: Should my child bring a water bottle? A: They can, but there is also water available while at the fields. Q: Will the trainer tape my ankle if need be? A: Yes they will, but you will need to bring it with you or buy some at the camp store. Q: What do we do if we are running late to camp check in from a vacation or another event? A: Please contact the director and let him know when to expect your child to camp. A: We do, there aren’t many, contact the director to find out more about scholarships available. Q: Can I combine discounts? A: No, take the discount that provides the most advantage for you. Q: Can Day Campers swim during camp? A: Yes, in the afternoon after the 2nd session there is free time when the camper can go to the pool. Q: How much spending money should I send with my child to camp? A: Over the years, the standard has been between $25 and $50 depending on camp store, evening pizzas, and game room. Q: Can we have an odd number of campers room together at camp? A: Please contact the director, we will explain what we have done in these cases over the years. Q: What happens if my child needs to take medicines during camp week? A: When you check in you will bring your child’s medicines to the trainer and explain what they need. They will be administered as needed for those campers that need assistance. Q: Can my child bring a phone with them? A: Yes, but we ask for them to leave them in their dorm rooms so it isn’t a distraction. Q: Should my child bring Sunscreen? A: Yes, it is advised for the hot, sunny days. Q: Can my child bring snacks/drinks to camp? Q: How many sets of clothes should my child bring to camp? A: They will need clothes for a possible 4 sessions a day. Q: Does my child need to bring a ball with them to camp? A: They will get one at check-in, but they are allowed to bring one if they choose to. For ages 4-9. This camp introduces new soccer players to all the basics to the game as well as helping those with a little experience focus on ball-mastery and getting comfortable with the ball. Bring your child to the 5th Street fields at 9:30 a.m each day and pick them up at 11:30 a.m. each day. On Thursday, there will be a short awards ceremony at 11:15 a.m.
$80 – includes a t-shirt, ball, camp picture, and awards/certificate.